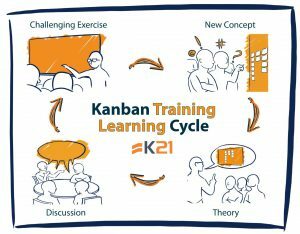 In two days, you will practice the concepts of Kanban and will learn how to overcome challenges. Funny, hands on facilitator, well prepared, great methodology choice, respective, punctual and fun..
Easy to understand and keeps you interested in what is going on and learning more. Funny – humor is always the best learning tool. Very knowledgeable. Life-Time Lean Kanban University’s KMP Foundation I certification. 16 SEUs from the Scrum Alliance. Knowledge21 is a global organization, present in the United States, Europe and Latin America, focused on Digital Transformation of companies willing to embrace True Agile practices. Our classes are dynamic, engaging and based on real scenarios. We do prefer group discussions and creative thinking over the traditional slide-based lecture. We provide an environment that facilitates the exchange of experiences between students and with the trainer. Come and discover why more and more people are applying KANBAN, even those that already apply SCRUM! The theory always comes after practicing, in a “pull system for teaching”.